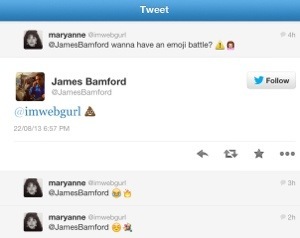 I started an emoji battle on Twitter with James last night. it didn’t last very long. Nothin’ beats the poop emoji. lol. That’s one of the many thousand reasons I like James. He’s playful. I remember times when I’d be telling my Mum about some Twitter battle I was having with James. She’d just say, “How old are you two?” She didn’t get Twitter, thought it was a waste of time. I placed a hold on The Art of War once. I thought it might help with my strategies. It didn’t. I planned to spend a month sending him random baby congratulation gifts a few years ago as a prank, but chickened out. Probably wise, no-one pranks James. Next Will BamBam stunt co-ordinate WoW? That is the question!